The record revenue was fueled by a 41% increase in the number of loads moved, with 26% more revenue per load, compared to January 2017. Costs rose faster than revenues, however, adding 70% to labor expense and 24% to non-labor expense, as freight brokers invested in personnel and technology to prepare for business growth. This benchmark report is administered by DAT Keypoint, and draws data from an aggregate of more than 100 DAT customers, based on more than 25 key performance indicators. The group's 2017 average annual revenue of $19.5 million grew 26% compared to 2016. To receive future monthly updates in your inbox, subscribe to the DAT Broker Benchmark Report. 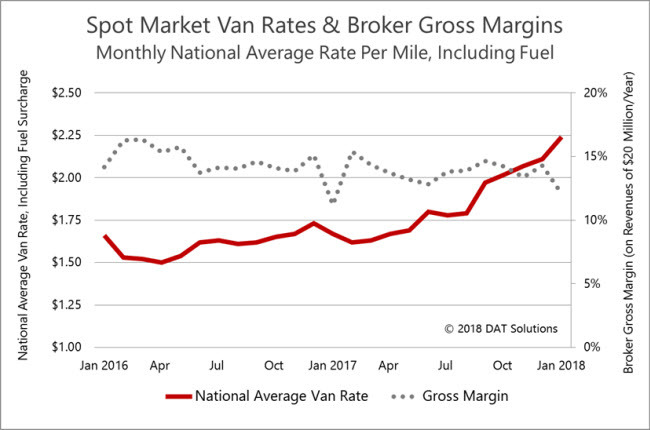 Spot market rates soared to record highs in January, and the national average rates paid by brokers exceeded shipper-direct contract rates for all three equipment types. As a result of the rapid increase in the cost of purchased transportation, the brokers' gross margins dropped to an average of 12.1%. That compares favorably with a 11.2% gross margin in January 2017, but margins were higher in the intervening months. Average gross margins were most likely to decline for brokers who were locked into long-term pricing agreements with their shipper customers. Net operating profits for the group rebounded into positive territory in January 2018, rising to 7.4% of net revenue due primarily to revenue growth. January has not been a profitable month for freight brokers in recent years, but rates were unusually high this year, and some companies may have deferred profits from December to January to take advantage of the new tax laws. Apart from the operating profit, 67% of January's net revenue went to labor costs, while 23% went to non-labor expense, and 2.8% covered interest, taxes, depreciation and amortization. Expenses climbed throughout 2017, as freight brokerage companies in the group invested in personnel and technology to manage expected revenue growth. Some brokers chose to accelerate expenses for payment in December, to achieve more favorable results under 2017 tax laws. During 2017, labor expenses (blue) grew faster than non-labor expenses (gray) in dollar terms and as a percentage of net revenue. Revenue per employee (blue bars) climbed to an average of $77,481 in January, edging out the previous record high of $77,204 in October, despite an 11% increase in the number of employees during that period. More dramatically, average net profit (green line) in January rebounded into positive territory at $689 per employee, despite a 30% increase in headcount, year over year. The group had recorded an average net loss per employee in both December and January of 2017 as well as in the same months of 2016. Note that some brokerages accelerated expenses or deferred revenue in December, for tax purposes, which could lead January results to be higher than expected. Load counts increased 7% for the group in January, month over month, to a record-breaking average of 1,423 loads. Compared to January 2017, load volume soared 40%. Revenue per load (purple bars) averaged $1,617 in January, setting another record for the month. January's revenue per load represented a 5.5% increase over December and a 26% boost year over year. Profitability turned positive, at $14.38 per load, compared to a loss of $4.08 in December and a $20.28 loss per load in January 2017. Profitability would likely have been higher in December, but some brokers moved profits to the new tax year.